2. Location - Whistler, B.C. Canada. Long story short, I've decided to thin the fleet a bit...here are some descriptions of items i don't need. Mini-Z AWD running chassis with a 3010 F1 board(for the low crystal). I can include a variety of wheel offsets to suit your needs in a variety of colours and I'll include another smoke chassis and stock chassis parts for rebuild purposes(the chassis it's built on is a bit roughed up) It does not come with a body. All chassis can include controllers if needed. pics upon request...although the F1 is not fully built at the moment and would take a couple days to get assembled for pics. Last edited by cowboysir; 2008.05.17 at 03:12 AM. Can you get pics of item 1? Do you know what version Nelly is on item 1? I'll get pics in the AM for those interested in item #1. Last edited by cowboysir; 2008.05.14 at 09:38 AM. I would like to be #2 inline for the F1. That is a great deal, as I am looking for a HFAY car, and the new motors should make the Fet stack necessary..
EMU has reserved the chassis #1 with the Nelly. mk2kompressor has reserved the F1. AWD may be a pending sale. Thanks everyone for your interest...I may be clearing out one or two more items in the near future, depending on whether I have enough guts to build another car or two. I'm still waiting on corbo for a reply...if anyone else has interest in the AWD please feel free to drop me a line. EMU: your package left today. Deal pending (still) on the AWD but I'm still open to offers. corbo, your last email suggested haggling for a lower price...I can't accept a lower price since I'm already accepting half the shipping costs to France. If you paypal me one of the quoted prices in my last email then we have a completed transaction. email replied corbo...awd is sold. thanks everyone for their interest...I may have one more car for sale in the near future so stay tuned. 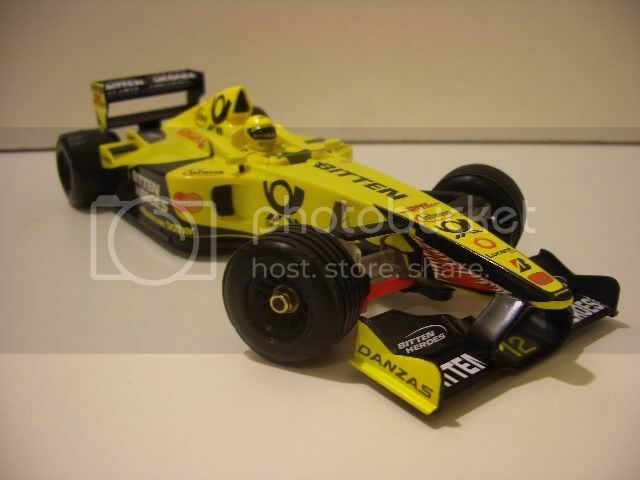 I'm semi considering selling this F1 car...I put a lot of effort into finding one but i'm sort of afraid to race it. If noone wants to pay what i'm asking then I'll just shelve it until i get better at racing F1 class. If someone wants the chassis but doesn't care for the body, i can mount a Ferrari(either 2001 or 2003) on it for $175.